Risk is off this morning after results of another HSBC Purchasing Managers Index for Chinese manufacturing gave a poor reading. The Aussie dollar took the brunt of this news, falling sharply overnight (GMT) against the US dollar. 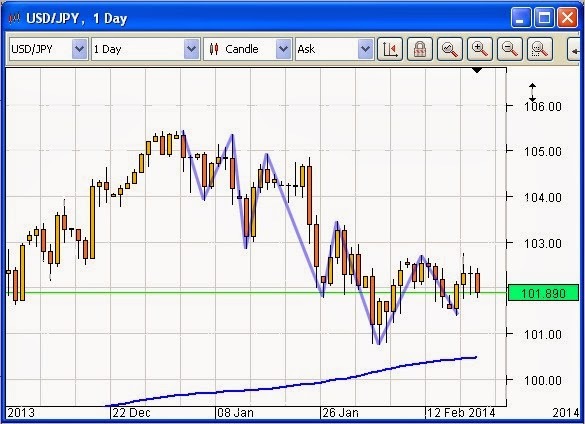 Now risk is off and there are two conflicting forces at play in the Forex market. On the one hand there is a demand for safe haven instruments, which always occurs when risk is off. The Yen and the precious metals, particularly gold and silver, fulfil this purpose. However, the minutes of the last FOMC meeting were released last evening (GMT) and they were unequivocal with regard to the determination of the Committee members to eliminate Quantitative Easing. There was, apparently, even some discussion about when interest rates might have to be raised. This is the first occasion since the onset of the Great Financial Crisis that this has happened. This should be strongly supportive of the Greenback. This is illustrated by the battle that is taking place between the Yen, as a safe haven currency, and the US dollar, in the light of the stance that the FOMC has apparently taken. See the chart at top. Later today brings consumer inflation figures and initial jobless claims from the US, each of which will undoubtedly have a bearing on all of this. There is some mystery as to why, if the rate of unemployment in the USA is falling, as it is, the number of new Non-Farm jobs has declined in the last two government reports on this topic. This seems like a contradiction and can only be explained by the assertion that more and more people are opting out of the workforce. In recent weeks it has been represented that these people are so fed-up being rejected for work that they have decided to stop looking. Now the president of the Federal Reserve Bank of St. Louis, James Bullard, has come up with a different theory, which we like. This is that the participation rate is falling, not because of disillusionment on the part of workers, but simply because great swathes of baby boomers are retiring. This makes excellent sense. The children of the population explosion that tool place just after World War Two, which provided the masses that made the ‘Sixities so exciting, and who went on to become the workforce, consumers and ultimate drivers of the various bubbles we have witnessed before and after the turn of the last century, are retiring. And this is making the unemployment rate look good, which is still one of the primary factors in the deliberation of the Federal Reserve when it comes to monetary policy.